I was having drinks at a friend’s house last night, who is a cuistot, the French slang for a cook. I don’t think you’d say cuistat for a woman, but whatever you want to call us, the conversation pretty much stayed on one topic: Food. We talked literally for hours while we drank brisk sauvignon blanc and picked apart an amazing wedge of 30 month-old Comté cheese from a giant wedge on a cutting block positioned strategically between us. For some reason, the conversation turned to food intolerances and allergies, which aren’t all that well-known in France. I’ve never been invited to a dinner party at a French person’s house and quizzed about what I don’t eat in advance. (Although since being served squid once, I’ve learned to be pro-active so it doesn’t happen again.) Yes, there is a growing consciousness about various food intolerances, although there isn’t a large-scale comprehension about many of the various diets and regimes out there. During our conversation, I’d mentioned to her that a few products were becoming more widely-available, like lactose-free milk, and there’s even a gluten-free restaurant in Paris now. I don’t know if she was entirely convinced, but she gave me a barely-touched jar of agave nectar when I left. As a cook, I actually don’t mind when people have dietary issues when coming up with a recipe, although one recipe can’t possibly be all things to all people. Being a baker, I do like to experiment with different flours and grains, and I love the flavors of various honeys and liquid sweeteners because they change the profile of a dish in interesting ways. Unexpectedly, this weekend I had dinner with a fellow in Paris who makes raw chocolate bars, sweetened with….you guessed it—sirop d’agave. I snapped a corner square off the bar and slipped it in my mouth, expecting the explosion of dark chocolate as the bar boasted 77% cacao solids. However it was smooth, and doux, and much to my surprise, the lively flavor of the chocolate was because blended in was a mixture of 7 épices. I realize now that I’m not only straddling two cultures, I often find myself sitting between two culinary cultures here. See how complicated my life is? Luckily not everything is complicated in my life. Like these Involtini, which are pretty great for several reasons. The most important is they taste good, but also because they’re very easy to make and require only three easy to obtain ingredients. They can also be made a few days in advance and actually improve as they sit. 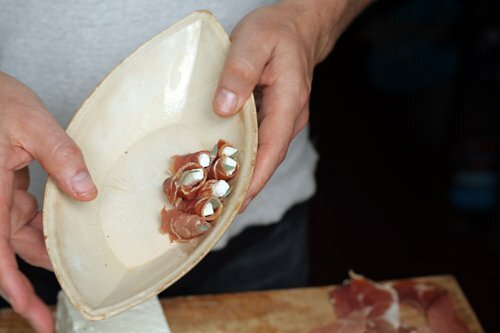 And they’re inexpensive; just three slices of ham and a small rectangle of feta yields around twenty five involtini. 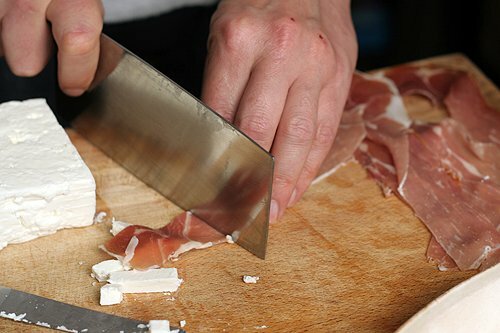 Unlike baking recipes, the actual amounts of ham and feta will vary, depending on how you (or the person slicing the prosciutto) cuts them are. But they’re not meant to look perfect, so don’t worry if the slices aren’t exactly the same width or the pieces of feta vary or crumble a bit when you slice it. 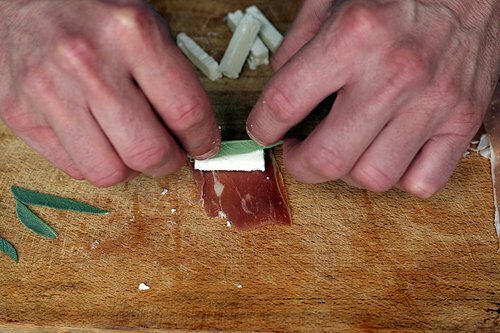 Simply nudge them back together and roll them up in the prosciutto. No one will be the wiser. This easy recipe, I shall have to try. First, I read your ‘related post’ on “8 things to know about choosing olive oil” and am in agreement with your points. But, I still have a question about olive oil. is anything wrong with water that has ice in it.The clouding clears up as soon as the oil is warmed to room temperature or above. This response did little to assure me that the quality remains unchanged. David, what a great idea. These would be great little canapés at a party. Cheers. 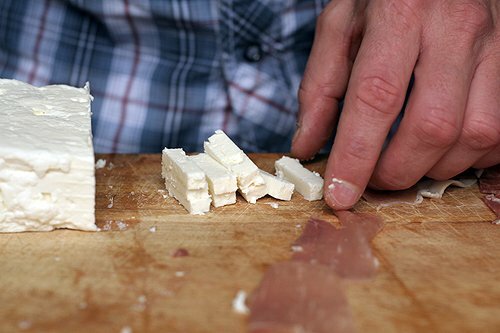 My fromager carries a feta that’s made with sheep’s milk AND cow’s milk — and it rocks. Last summer we ate it in every salad we could dream up, then when we ran out of ideas we’d just sit and eat it plain. It will be killer in these little jewels, too. this looks incredibly delicious. perhaps it’s your feta-ccompli! David, how do you manage to keep such lovely smooth hands in this dreadfully dry European climate, all while washing dishes? I’m only (?) 29 and my hands are…nasty. These look delicate and delicious. What a great idea! Marlene, clouds in your olive oil really, truly just mean that it’s been cold. All the bottles in the stores here in Francego cloudy in the winter, as the trucks aren’t shipped, and most of the distribution centres and warehouses are unheated (or only minimally heated) — it really, really is just a reaction of the oil to the cold, and doesn’t affect the quality at all. I don’t like how it looks, though, so I lay the unopened bottle on the radiator for a few hours, and it clears up with no problems. The labels of many of the brands I’ve seen even say that if it’s cloudy, it just means it’s gone cold, and to warm it up if it bothers you. 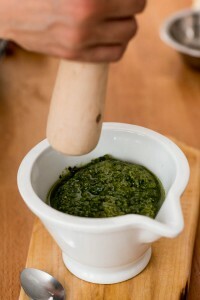 in cooking, salad dressings, etc.. Meanwhile, I have found a store nearby, their oils (same brand) don’t have the cloud! And now , I probably shouldn’t even raise the topic of the ‘mother’ – and I mean huge mother in my Colavita Balsamic vinegar! Gosh, it is enormous! Gigantic! I am so excited to make this! I think I might use chevre mixed with a bit of honey. I don’t know how much of the finished product I’ll have after nibbling while I put them together.. This looks really good! Being Greek I know that feta and olive oil are the best ingredients… and I would use oregano for this. Wow, this is a similar variation on ham roll ups that I experimented with a year ago. The traditional ham, cream cheese and green onion roll-up sliced into pin wheels has been a favorite around here for decades. One gathering of male kite fliers (one must bring alcohol and a dish to pass) had three of us show up with ham rolls and no one seemed to mind the seeming redundancy. 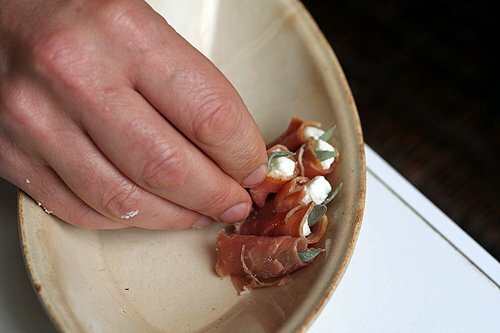 I tried the prosciutto, goat cheese variation with a thin slice of shallot about a year back. The “onion” component does age with the cheese real well in the fridge. The problem with this version is the diminutive nature of these petite blasts of tasty goodness. My assembly method seemed to be “Roll one…plate it; roll one…eat it”. Thanks for illustrating the notion that there are not that many new ideas, just great variations on themes. 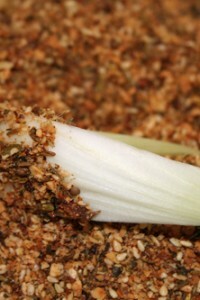 Wonderful Flavors…now to try it with herbs. Beautiful, because of the simplicity. A quick app for those warm summer afternoons (which will arrive shortly I hope)! Reminds me of another summertime staple, fresh sliced tomatoes and fresh mozzarella with some basil. I do believe I’ll have to try these, and soon. This a wonderful, flavorful and easy appetizer dish to prepare. I love it! This dish is has been bookmarked to make for a Friday night bottle of wine and appetizers. Thanks. I love the simplicity and the look and I can already imagine the taste and I especially love that they can be made well ahead of the devouring hour. The mixture of your monologue and photos of execution was a pleasure to see and read. Such style. Thanks for the recipe. 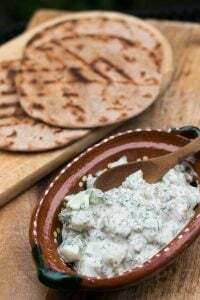 I live in Bulgaria, so feta cheese is real source of national pride. 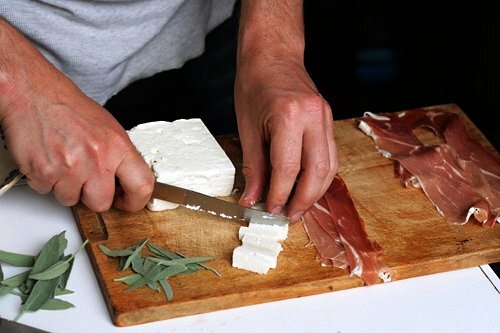 I myself am quite partial to the Bulgarian feta, which was available in Paris when I lived there, so it is worth a try. This looks easy and accessible as I am crap at organizing hors d’oeurves. I usually cook the meal and rely on others to supply the beginning bits! Thanks for the recipe! The only thing that could possibly make these more delicious would be eating them on a terrace on a warm evening with a view of the Mediterranean. Where do I sign up for that? I love small bites like this. The closest I’ve gotten to this is to wrap a quarter of a fresh fig, and a mint leaf in proscuitto and served it with blue cheese.. I’ll do in a combo with the feta plain next time, I love salty, sweet and creamy together. Yet another delicious and quick recipe. Thank you so much ! The perfect recipe to take to a party I’m going to — thanks David. @Marlene, We have a cabin in the mountains and during the winter when we go up, and the temperatures have been very cold, the olive oil in the pantry is sometimes solid or looking as you describe. What the rep told you is true. As soon as the heat goes on and the house warms up the cloudiness starts becoming less and less until it is clear. There is no change in the taste that I have noticed. Sometimes this happens 3-4 times before I use the bottle up. So, enjoy! Congratulations on winning the Saveur award, certainly deserving for a stellar blog. Many best wishes for more success David. These look delicious–I love simple, unfussy finger foods like this. I think they will be perfect for a summer evening on the patio, with some thin slices of french bread to sop up some of the oil. I love, love, love agave syrup mixed with cocoa powder and drizzled over ice cream, bananas, a slice of cake. Instant chocolate fix! I am in the process of planning a casual cocktail party (pre-wedding) for my hubby’s daughter. I have decided to do something simple and mostly Italian. I will definitely have to include these. They will fit right in with the menu! Yum! 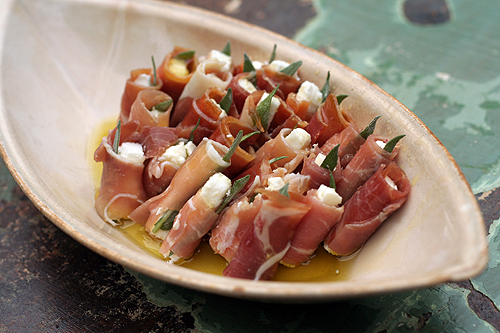 I love proscuitto and look for any excuse to use it!! Please excuse me if I don’t offer you any sympathy for your “complicated”, culturally enriched life!! The recipe sounds great but I am truly jealous of the Comte cheese. I tasted it first in Bordeaux a couple of years ago and have since become hooked. Beautiful slab of feta. I also like the plate and distressed table/background. Very tasteful! As far as food allergies go, I heard an interesting podcast on NPR about the benefit of having Hookworm and this guy who intentionally infected himself to assuage his allergies. Google -Radio Lab and Hookworm. David, you are the best. I love your website. I love the way you write. I love your photographs. As usual, a great post. So pretty! I do roll-ups with green beans or asparagus in prosciutto. Trying feta next. Thanks! This really is food I adore. Simple, beautiful and tasty! Enjoyed with a glass of red wine and friends – perfect. These look marvellous. I see you and a few of my favourite food bloggers were honored by Saveur magazine. I say congratulations and well done. It is interesting that food intolerance/allergies seems to be more of a North American phenomenon, unless religious requirements are taken into account as well. Your involtini are certainly perfect for a gluten-free party! Food intolerance is becoming big news over here in the U.K too. Within the last two years I’d say. In the larger supermarkets you now find at least half an aisle of “free from” foods – mostly inedible I’m afraid. I used to spend a lot of time in Italy and like France food intolerance is not something which comes up often. Could it be that on the whole the French and Italians eat less processed foods and possibly are less stressed than people in the U.S and U.K? I have a theory that stress leads to suppressed immune systems which lead in turn to immune systems going into overdrive at the slightest “threat” ie. gluten, dairy etc. Fads, trends, styles, conditions etc often start in the U.S and then slowly infiltrate their way around the rest of the world. It’ll be interesting to see whats happening around Europe in 5-10 years time. Fab pics and idea as always. Simple is always best – and olive oil IS a flavour, isn’t it??? Is it wrong that I’m craving this for breakfast???!!! What a perfect little nibble! These involtini look lovely, and the perfect start to a dinner I’m planning for this weekend. And I have to say that your post made me giggle. I can’t tell you how many times I was offered fois gras in France. I was a vegetarian for 10 years, during one of which I lived in Toulouse. My most memorable fois gras moment was when a friend’s sister tried very hard to convince me that it was no different than eating eggs. The logic was wonderfully French, and pretty sound when you think about it! Looks and sounds delicious. I always give you credit when I impress my family and friends with your recipes, although I will admit to sometimes wanting to take full credit! If you slice them into little discs, they’re similar to “frog eyes” we eat here (cream cheese, not feta – I’ll try it with feta next though). Wait, those have pickles in them too. Haha. Crazy midwest food. When I make involtini, I use any cream cheese (kiri, carré frais, philadelphia) and add some lemon juice and a few drops of tabasco. Mix and use instead of the feta cheese. Another great success! Congratulations on your new book release! I order it from amazon UK and cant wait to receive it. I love your blog and your amazing and delicious recipes, you are an inspiration. Mmmm, looks so beautiful, especially as you used fresh sage. 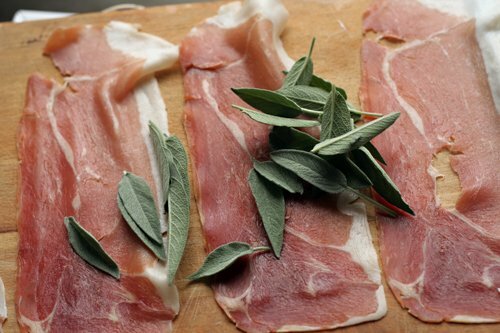 For a chicken treat place sage leaves and a little knob of butter or drizzle of olive oil inside pieces of skined and boned chicken thighs (I cut each thigh into 2 pieces) wrap the chicken pieces in prosciutto and bake at about 180C (350F) until chicken is cooked but still juicy. Let cool a little then slice and devour – or just devour anyway. I love your blog and your recipes — and this is one I’m definitely not afraid to try making. I went today and picked up everything I needed — will be enjoying these with a glass of Prosecco tonight on the patio. Thanks for posting!! About food allergies, I found a wonderful company that prints laminated cards for travelers with messages in a multitude of languages explaining what you cannot eat. You can get it in your native language and in the language of the country you are visiting. They have standard cards, but they will custom make one if you have a unique problem. These little cards are life savers. Here in Australia (or Tasmania at least), when people invite you for dinner, they don’t ask what you don’t eat either. Since you say you like to experiment with honey,would you like me to send you some Tasmanian Leatherwood Honey? It’s unique to Tasmania since leatherwood flowers can only be found here. The company I work at actually makes Beer Shampoo Bar (yes!) with Leatherwood Honey & local beer. A while ago, you wrote about Tasmanian pepperberry. I can send you some Tasmanian pepper also if you’d like. Yum! These are so delicious, and the photos do them justice. OMG; vegetarians in Paris; my latest were the daughter and son-in-law of cousins from LA; vegans no less; how can anyone come to France, much less Paris and not eat cheese. I really tried to warn them, but they could not get it through their heads that life outside of California is not about esoteric diets. Even my yoga teacher ate cheese while he was in Paris for a workshop. And they were highly offended by the lack of handicap accessible things (not that they needed them; they were traipsing around Paris with 50 lb backpacks). Yet I have noticed that somehow, even very elderly people in Europe seem to manage without all those things. Maybe the reason they can go up and down stairs is that they have always had to. Not that I am against any of those things. Believe me, I spent a lot of time pushing my mother around France in a wheelchair and it was not easy. But traveling is about flexibility and rigid diets that are not medically necessary can cut one off from one of the most basic ways to get to know another country…via the food. Thanks for the great recipe! One of my friends really like that type of ham. Isn’t it a Spanish ham? A great way to use sage! These will be great for parties. What does “involtini” mean? 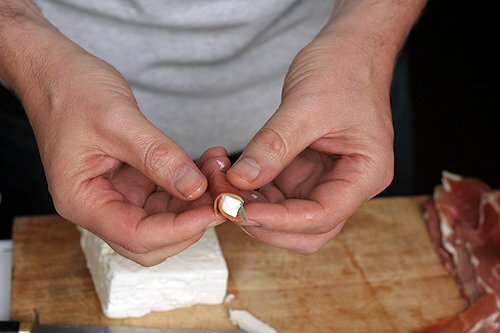 As I was prepping for my post about real feta, I came across your blog. Wonderful!!!! Made this and the Salmon Rillettes for a dinner party on Saturday – they were both so amazingly excellent! Thank you!